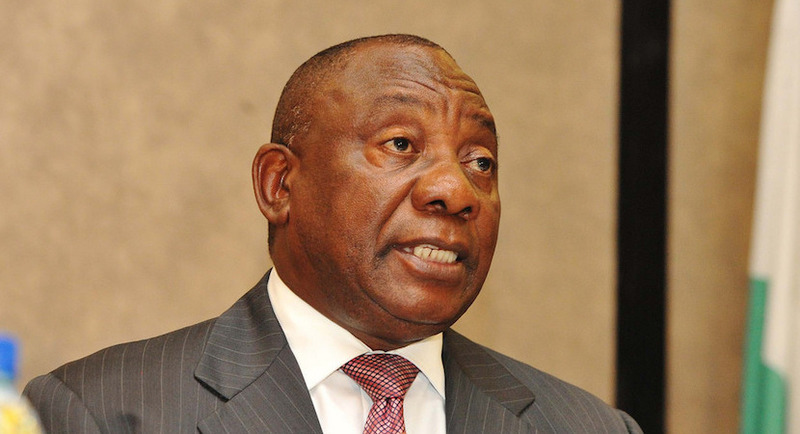 (Bloomberg) – South African President Cyril Ramaphosa had hopes of lifting economic growth to 3 percent in 2018. Economists think that goal is even more unattainable than before. Average gross domestic product will be 1.4 percent this year, according to the median prediction by 22 respondents in a Bloomberg survey, which takes place monthly. This less than the 1.5 percent forecast in the July poll and is the fourth consecutive reduction in the outlook, which peaked at 2 percent in April. The estimates for both the current-account and budget deficits are wider than last month, the results showed. South African President Cyril Ramaphosa. Ramaphosa promised to stimulate growth and attract investment, fix state-owned enterprises, and root out the corruption that marked predecessor Jacob Zuma’s administration. While he’s made inroads on curbing graft and has received $35.5 billion in funding pledges, he announced in July he would seek a constitutional amendment to allow expropriation of land without pay. The move could undermine property rights and deter investment, some analysts say. Regulatory uncertainty is also making companies reticent to invest in industries such as mining, which plans to cut at least 14,000 more jobs imminently. “To fix the economy, we need strong political and business leadership,” as well as clarity on policy, land reform, and the restructure of the state, among other things, Peter Worthington, an economist at Absa Group Ltd. in Johannesburg, said by phone. “We need stronger domestic confidence and business investment” to boost growth, he said. The unemployment rate in Africa’s most-industrialised economy is 27.2 percent, near a 15-year high, and GDP hasn’t expanded at more than 2 percent since 2013. The central bank reduced its economic growth forecast for this year to 1.2 percent in at its July meeting, below last year’s rate of 1.3 percent. The projections are worrying and won’t make a dent in the jobless rate, with the country not taking advances of the recovery in the global economy while policy uncertainty deters investment, Governor Lesetja Kganyago said Wednesday. Business confidence has slumped each month after reaching a record high in January, its longest losing streak since 2011, as industries await real reforms under Ramaphosa’s administration. While the index rose in July, a sustainable improvement in sentiment will depend on the removal of policy and political uncertainties, according to the South African Chamber of Commerce and Industry, which released the data on Aug. 8. The prediction for the unemployment rate this year rose to 27.4 percent from the July survey’s 27.3 percent The outlook for the current-account deficit worsened to 3.5 percent of GDP from 3.4 percent before The budget gap is seen at 3.7 percent of GDP from 3.6 percent previously Consumer inflation will average 4.7 percent in 2018 compared with a previous forecast of 4.8 percent.